Special congratulations to Class of 1970's Mike Sweeney! A Hillsdale College professor has received the 2016 Michigan Association of CPA's Accounting Teaching Excellence Award. Michael Sweeney received the award at an Oct. 5 ceremony in West Bloomfield. Sweeney has taught at Hillsdale College for 20 years and holds the Evert McCabe/UPS Memorial Endowed Chair of Economics. In addition, Sweeney is chairman for the Hillsdale Hospital Authority Finance Committee and teaches "Decision Making for Managers" as an adjunct professor at the University of Maryland. Sweeney also coordinates Hillsdale College's Volunteer Income Tax Assistance, an IRS-sponsored program that pairs students with local community members in need of tax-preparation support. The Accounting Teaching Excellence Award recognizes educators who excel in teaching accounting and promoting the CPA profession. Special thanks to Sharon Tucker-Bright (fka Mrs. Bolduc) for having the video converted to DVD for us. If you'd like a copy, please email aggiealumni@comcast.net to get your copy mailed to you. You did not have to be present to get a copy... makes a great gift too! LISTED BELOW ARE BUSINESSES OWNED BY FELLOW AGGIES. Regardless of the economy, it is important that we support each other and help our community to strive and grow. Please support and promote these businesses and services to your friends, family, neighbors, co-workers etc. They are all owned and operated by our fellow Aggies. Jeanne McCormick, former teacher at St. Agatha, is using her God-given talents and is able to be commissioned for art work. Her portrait of Mark Radeke inspired many Aggies to ask about her and her work, visit her site to view and learn more. Terry Wagner, Class of 1985, Proud owner & operator of Uniforms and More, LLC- Get all of your embroidering, screen printing and digital printing needs taken care of by caring, competent and creative staff, who work hard to complete your designs with competitive pricing! Call 734.558.5660 to have all your questions answered or visit their Facebook page here. Kelly "Kellioke" Brazzil, Class of 1984- Karaoke/DJ Services- Reunions, Graduations, Weddings, Anniversaries, Parties- Event Specialist 313.282.1895 Ask for the Alumni Discount!!! Walsh's Service 25639 West Seven Mile (east of Beech) in Redford 313.532.2823 Auto Repair and Service. Richard Walsh, Class of 1968, and Tom Walsh, Class of 1971, both continuing their family owned and operated business that opened in 1960. Jeanne McCormick, former teacher and parishioner, is a very talented artist. 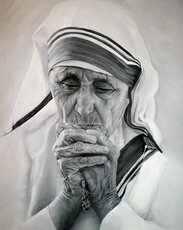 Here is her oil painting of Mother Teresa that she submitted to the Grand Rapids Art Show, yes an oil painting, not a photograph! Visit Jeanne's website to view some of her incredible art! Kevin Garrity, Class of 1982, has two books to add to your collection of good reads, "Sparrow River" and it's sequel "The Hatchery." Make sure to pick up your copy at your local bookstore, or order online through Amazon, using this link! Scott Paul Frush, Class of 1986, has a few genres in his repertoire. Besides his trivia books, Italian, Wall Street, Catholic, and Republican, Scott writes about investing. Please follow the links below to get his books. Not only are you supporting Aggie authors, you are supporting local authors! 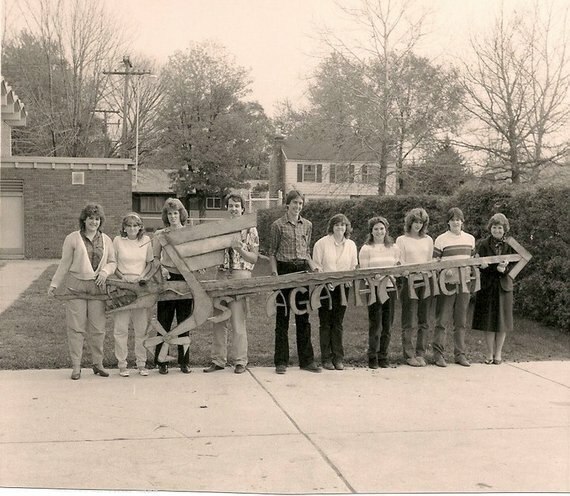 Click here for the link for The Detroit Catholic School Heritage Project. The mission of this site and this project is to preserve the rich history, tradition and heritage of the Catholic Schools of the Archdiocese of Detroit, past and present. This site is not sponsored by any organization. It is motivated by a desire to remember and to celebrate all that has preceded us, before it is lost forever. It is also an attempt to remind us of the values of a Catholic education, and the bonds Catholic education has forged among the people of Southeast Michigan. Visit the site to see what others are saying and sharing about St Agatha and other Catholic schools and parishes. Contribute where you can! It is a GREAT site, and they hope to one day have a physical "home" for all of those closed institutions, so they are never forgotten. ST. AGATHA AGGIES T-SHIRTS, SWEATSHIRTS & HOODIES! Available in: green on white, green on grey, white on green or gold on green! Created and manufactured by Terry Wagner, proud Aggie, and owner of Uniforms & More LLC. Order your friends, family, and yourself one to show your Aggie pride! Show the world that the St. Agatha Aggies are not gone or forgotten! Order in time for Christmas, and for the next reunion! Once an Aggie ~ Always an Aggie! If you have pictures of the school, the church, the grounds and want to share, please do! Any type of history to incorporate onto this site would be greatly appreciated! I am hoping that you can take 30 minutes to listen to Phil Hickey's speech. He graduated from our beloved St. Agatha in 1972 then went on to Michigan State. He became the owner of Cookers, Rio Bravo, and then Dakota Steak house and many other food chains. His talk is about growing up a Catholic and his faith and what life has taught him. Take a few minutes and listen to his wonderful speech! This presentation was made at the National Hospitality Prayer Breakfast in Chicago during last month's NRA.